Document imaging makes it possible to integrate paper documents with existing workflow processes and business applications, e.g. e-mail, fax, and electronic document management systems. But before introducing paper into electronic-based processes, you want to be sure that document imaging is safe and document integration secure. Whenever shared office scanners and MFPs connect to a computer network, security is a primary concern. To help companies understand some of the security concerns, Ed Schmid, eCopy’s CEO, put together the following tips on security at MFPs for Business Week’s Tip of the Day. a. User Authentication. MFPs can be set to require network passwords, a basic level of access control that prevents non-employees from using the MFP and ensures asset control. b. Permissions Authentication. Require users to enter passwords to gain access to specific business applications from the MFP, just as if they were entering from a PC. c. Document Encryption. Applying document encryption at the MFP helps safeguard confidential information before it is transmitted across the network. d. Delete Temporary Files. Most MFPs automatically keep a record of files that have recently been scanned. If these temporary files are left on the MFP, sensitive information can be accessed by unauthorized users. Set up your device to delete these files automatically. e. Activity Tracking. MFPs can be set up to create audit trails that can identify who sent what document, where, and at what time. For the full Business Week article, click here. 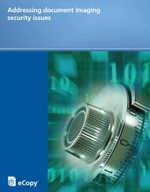 Or, for more in depth information, download the white paper “Addressing Document Security Issues”. Alan Joch wrote an interesting post on the Printing & Imaging Blog this week about insider security breaches and steps companies are taking to protect their information. He suggests that companies investigate print logs – paying attention to what is printed, who is printing that information and when (during or after business hours, for example). Some document imaging solutions are able to address #1, and some can also address #2. However, this company also wanted the ability to encrypt scanned documents, a very common document imaging requirement. By adding encryption to the mix, the ability to log and store the actual content of scanned documents is a much more difficult task. But it is an important need to address. Think about it. An employee may very well think that they can go up to an MFP, scan a document, encrypt that document and send it via e-mail. Because it has been encrypted, they believe that no one could see what the contents were. To my knowledge, eCopy ShareScan is the only imaging solution that can handle this requirement. Our document tracking feature, which is accessed through the administrative console, can be set to both log document scanning activity and send a copy of the scanned document to a storage location that has access dictated by network security policies. If the document has been encrypted during scanning, the copy sent to the storage location is stored unencrypted. The beauty of this is that is doesn’t restrict functionality such as encryption that is used for “good”, it just lets you track abuse. So if there is a need for “Big Brother” in an organization, you should make sure that both the ability to log print and scan jobs is included. And make sure that there are no loopholes, such as encrypted documents, that can poke holes in these security measures. EMC last week announced Captiva eInput 2.0, a Web-based distributed document capture solution designed to make the scanning and indexing of paper documents from remote offices faster and easier. This is the second announcement within a week from a large ECM system vendor that is focused on capture – further emphasizing the growing focus on document imaging within the ECM space. Captiva eInput is an extension to the Captive InputAccel platform and basically allows employees in remote locations that do not have access to a centralized scanning location for scanning paper into InputAccel to scan a document to a Web interface, where it can then be indexed and routed to the InputAccel server for processing. It is a great application for a single worker using a desktop scanner attached to a personal computer. However, what both of these recent announcements have not addressed is how to use shared scanning devices for distributed capture. Shared networked scanners and MFPs populate almost every office location with more than one or two employees. And having already made the investment in these devices, it does not always make financial or operational sense to also provide single-user scanning devices for capturing documents. Using an MFP or networked scanner to scan and distribute documents is easy and, by using a document imaging platform, can provide multiple distribution options for those documents vs. being tied to a single destination. Workers today are found in many differing office environments and a distributed document capture solution should be implemented to address the needs of all of these environments. The capture suites that many ECM companies are putting together help address some of the environments and can easily be supplemented by third-party capture solutions to deliver a complete solution. Document imaging makes it possible to integrate paper documents with existing electronic processes. But how do you ensure that the document imaging process is safe and the integration into the electronic processes is secure and meets information policy requirements and regulations such as Sarbanes Oxley? Since paper documents frequently contain information that is confidential or sensitive in nature, the security of those documents must be assured, perhaps even more so that their paper originals. To achieve this security in document imaging, three key areas must be addressed: users, documents, and devices. Users: When using a shared device in a public area to scan documents, authentication is essential to ensure that only authorized users have access to the network. Authentication can also provide an audit trail of what was send and by whom. Authentication at a scanning device should match existing corporate security policies and users should look for features such as session logon; authenticated Scan and Mail and Scan and Fax that dynamically integrates with the corporate e-mail and fax applications; and activity logging. Documents: With document imaging solutions, encryption, secure deletion of temporary files and inbox security can help keep scanned documents visible only to those with proper authorization. Devices: Security should be in place that limits the activities that can be performed at a shared scanning device. At a minimum, the document imaging system should provide the same level of network security as any desktop system on your network, including: restricted network access; auto logon and application startup; application lockdown; physical security of PCs; and eliminating any removable drives. Stringent user, document and device security standards enable companies to extend their electronic security protection to paper documents, opening up the wealth of productivity benefits that can be achieved through document imaging. Download the white paper Addressing Document Imaging Security Issues for more information.